HARTFORD, CT—Creating an electric and intimidating atmosphere with their cheers and vocal cries for blood, throngs of health insurance executives reportedly crowded into a massive outdoor coliseum on Aetna’s corporate campus Monday to watch one of their policyholders engage in a life-or-death fight against cancer. Sources confirmed that the stone arena was filled to capacity for the highly anticipated spectacle, with over 90,000 officials attending from providers as far away as WellPoint, Kaiser Permanente, and HCSC to see if the patient could survive an intense, brutal struggle with the advanced stage III illness. According to reports, the policyholder, who was equipped with limited resources of his own during the fight, immediately faced the punishing and grave challenge of successfully submitting claims for a preliminary consultation with an out-of-network oncologist. As a slew of taunts and jeers rained down from the hordes of health insurance professionals, sources said the increasingly weary combatant suffered a crushing blow upon receiving a $60,000 bill for one week of inpatient care that exceeded his plan’s hospitalization coverage limit. Experts confirmed that such cancer battles—along with kidney disease battles and lengthier diabetes battles—have been held in the coliseum since its completion in the early 1960s, and have remained a popular form of entertainment among American health insurance executives ever since. However, demands for more graphic carnage have reportedly grown in recent decades, with audiences clamoring to see patients become crippled by increasing premiums and left to die as insurers purposefully delay processing authorization forms for costly surgical procedures. The most famous of the coliseum’s challengers is said to be legendary Cigna plan member #ZH0115672, who bravely fought breast cancer for six years before finally succumbing to the disease in 2004. 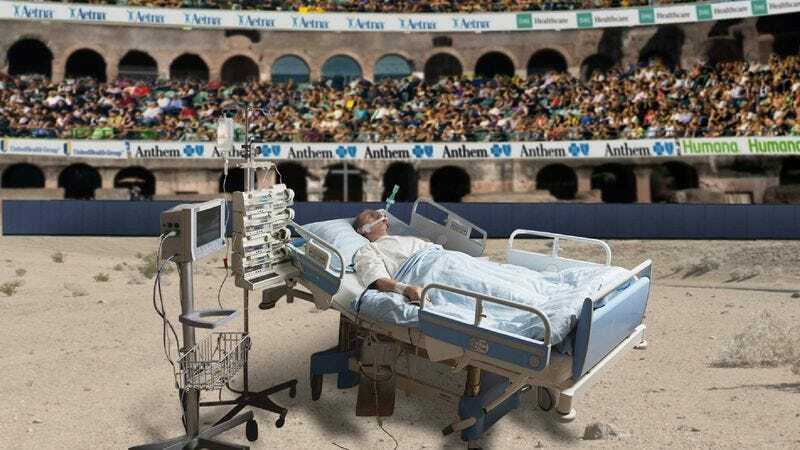 Sources said the 63-year-old policyholder almost incited riots in the stands after contesting a claim for post-operative mastectomy care through third-party arbitration, though the situation was fortunately defused when the arbiter sided with the health care insurers. At press time, deafening chants of “Deny! Deny! Deny!” drowned out the patient’s desperate appeals against new coinsurance charges, after which the president of Aetna reportedly smirked and slowly dragged his index finger across his throat.